Dani Alves trained with his Paris Saint-Germain team-mates for the first time in almost six months on Wednesday as the Brazilian defender moved closer to a return from a serious knee injury. Alves damaged the cruciate ligament in his right knee during the French Cup final against Les Herbiers on May 8. The full-back has not played since, missing the World Cup for Brazil and pre-season training with his club. The 35-year-old former Barcelona and Juventus player began light training earlier in October but club officials did not put a date on his return to first-team action, L’Equipe reported. 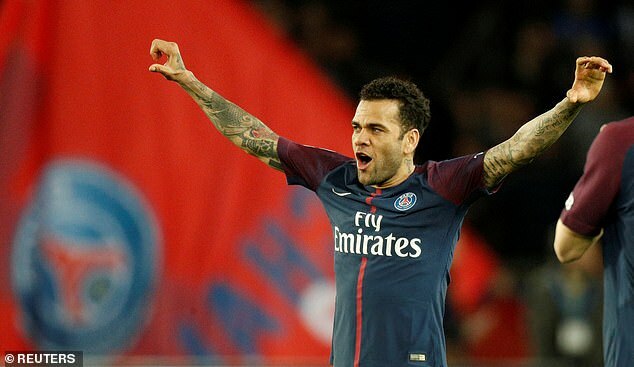 Alves joined PSG in July 2017 on a free transfer and featured 41 times across all competitions, helping them win the domestic treble along the way. However, he may find it difficult to return to a PSG side who have been in stunning form this term. Thomas Tuchel’s side have set a European record by winning all of their 11 opening games of the season and have already established a comfortable lead at the top of Ligue 1 with an eight point advantage over Lyon. The French side though are on the backfoot in the Champions League as at the halfway point in their group they sit two points behind Liverpool and a point adrift of Napoli. Meanwhile, PSG duo Kylian Mbappe and Adrien Rabiot were both disciplined by Tuchel after the pair turned up 25 minutes late for a team meeting after catching the first half of Barcelona’s 5-1 win over their rivals. Neither Mbappe nor Rabiot started the game, as pictures showed the World Cup winner cutting a glum figure on the bench.